Universal City, California – The sweeping and spectacular musical extravaganza Les Misérables has been seen by more than 60 million people in 42 countries around the globe. Now the motion picture adaptation that grossed more than $340 million worldwide arrives on Blu-ray™ Combo Pack, DVD and On Demand on March 22, 2013, from Universal Studios Home Entertainment. Critically acclaimed and star-studded, Les Misérables is a stunningly realized interpretation of Victor Hugo’s epic tale of broken dreams, passion, sacrifice and redemption – a timeless testament to the endurance of the human spirit. This Golden Globe®-winning cinematic event can now be experienced over and over again on Blu-ray™ Combo Pack and DVD with more than an hour of bonus features including cast interviews. Additionally, the Blu-ray™ Combo Pack is loaded with an extra 45 minutes of exclusive content taking viewers behind the scenes of the groundbreaking production for an unmatched entertainment experience. Directed by Academy Award® winner Tom Hooper (The King’s Speech), Les Misérables features an all-star cast including Golden Globe® winner Hugh Jackman (X-Men Origins: Wolverine, The Prestige), Oscar® winner Russell Crowe (Gladiator, A Beautiful Mind), Golden Globe® winner Anne Hathaway (The Dark Knight Rises, The Devil Wears Prada), Amanda Seyfried (Mamma Mia!, Dear John), Eddie Redmayne (My Week With Marilyn, The Other Boleyn Girl), Helena Bonham Carter (Harry Potter series, Sweeney Todd), Golden Globe® winner Sacha Baron Cohen (Hugo, Borat) and newcomer Samantha Barks. Adam Green, who describes it as “a spectacular achievement” and Deadline.com’s Pete Hammond, who calls it “remarkably entertaining and powerful” and praises its “stunning imagery and performance.” Les Misérables dominated the 2013 awards season, garnering eight Academy Award® nominations, including Best Picture, Best Actor and Best Supporting Actress, and sweeping the Golden Globes with awards for Jackman, and Hathaway, as well as the prize for Best Motion Picture – Musical or Comedy. 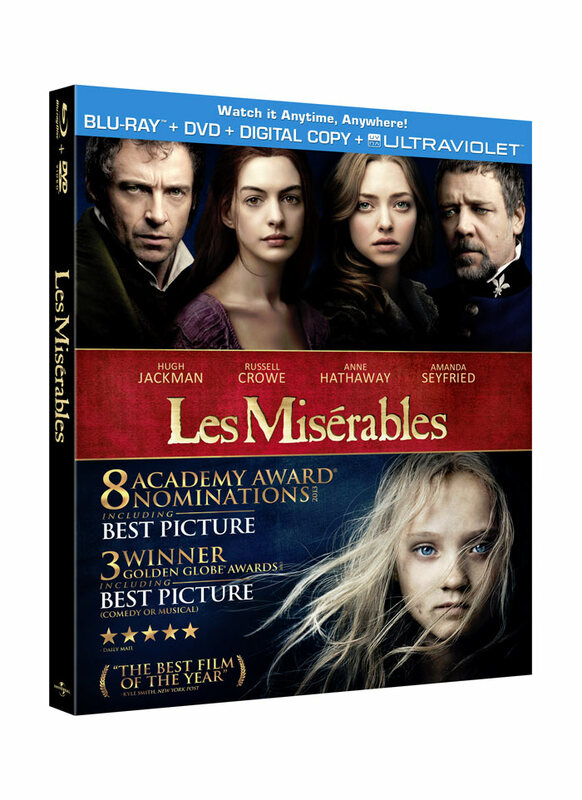 The Blu-ray™ Combo Pack allows consumers to view Les Misérables anytime, anywhere on the platform of their choice. It includes a Blu-ray™ disc, a DVD, a Digital Copy and UltraViolet™ for the ultimate, complete viewing experience. Hugh Jackman, Academy Award® winner Russell Crowe and Anne Hathaway star in this critically acclaimed adaptation of the epic musical phenomenon. Set against the backdrop of 19th-century France, Les Misérables tells the story of ex-prisoner Jean Valjean (Jackman), hunted for decades by the ruthless policeman Javert (Crowe), after he breaks parole. When Valjean agrees to care for factory worker Fantine’s (Hathaway) young daughter, Cosette, their lives change forever. This enthralling story is a timeless testament to the survival of the human spirit and “an unforgettable experience” (Richard Roeper, RichardRoeper.com).